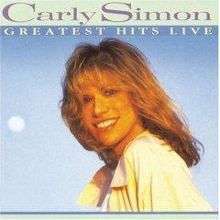 All the songs are live versions recorded on 35MM film from a 1987 HBO special shot on Martha's Vineyard called Carly Simon: Live from Martha's Vineyard, which was released in 1987 on VHS and in 2004 on DVD. The album version runs in a different track order than the video version, and three tracks from the video version are removed- "Give Me All Night", "You Have To Hurt", and "The Stuff That Dreams Are Made Of". The song "The Right Thing to Do", is included on the album, but didn't make it into the final televised cut of the concert. It would later be included on the DVD release as a bonus performance. Greatest Hits Live has been released on Vinyl, Cassette tape, and Compact disc. The album sold very well upon release, going Gold immediately. In 1996, the album was certified Platinum by the RIAA, for sales of over 1,000,000 copies in the United States alone. ↑ "Carly Simon Official Website - Live From Martha's Vineyard DVD". Web.archive.org. Archived from the original on June 15, 2004. Retrieved 6 July 2014. ↑ "Carly Simon certifications". RIAA.com. Retrieved 2014-08-10. ↑ "Carly Simon - Chart history | Billboard". Billboard.com. Retrieved 2015-04-01. ↑ "The Official Charts Company - Never Been Gone". The Official Charts Company. 1 April 2015.